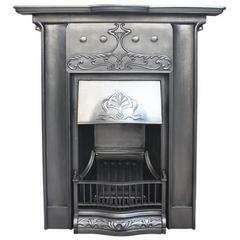 A charming and fully restored period Art Nouveau manor polished steel fireplace insert. A gently shaped top frame with cast decorative corners, the central scalloped shaped canopy, flanked by a pair of full height cast iron tiles showing Classic Art Nouveau inspired flowers, with a splayed three barred fire front with removable ash door. English, circa 1920. New bolts and nuts to the rear. French Art Nouveau walnut fireplace mantel with bronze floral trim and scroll carved sides. Fully restored tiled insert with original tiles and polished decorative iron Reclaimed from a property in Edinburgh, Scotland. Measures: Width 46” Height 44”.